The Karmapa emphasized the importance of sustaining our commitments once we have received an empowerment and nurturing through practice the seeds it has planted. He also pointed out how we really do not know what the Buddha looked like as images of him came some 600 years after his parinirvana. He is also said to be inconceivable, but that might prevent us from establishing a heartfelt connection with him, and therefore, we meditate on the lama as inseparable from the Buddha. The Karmapa began his talk today by explaining the difference between the guru yoga that is a part of the mahamudra preliminaries and the Four Session Guru Yoga by the Eighth Karmapa, Mikyö Dorje. There are numerous guru yogas of various lengths in the Karma Kamtsang tradition, the Karmapa explained, and among them all, the most precious is the Four Session Guru Yoga. 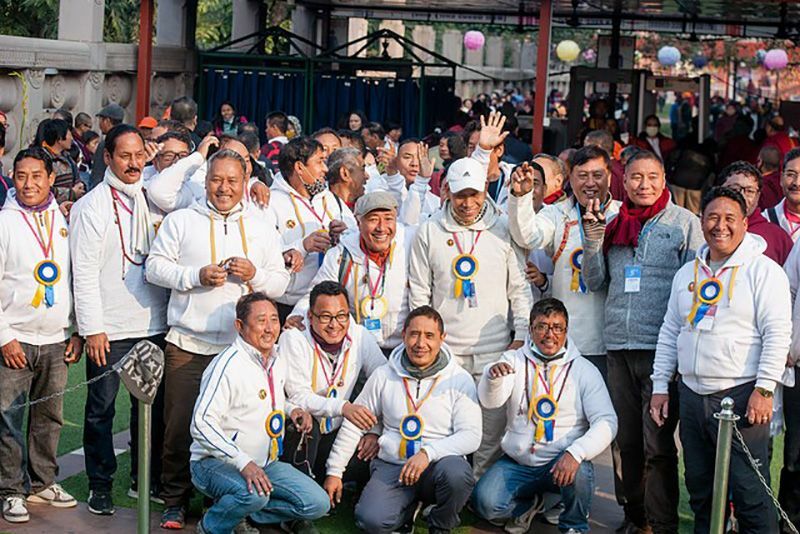 However, people from different traditions have received the Chakrasamvara empowerment and made the commitment to do a guru yoga practice, but this does not mean that they have to do a Kamtsang guru yoga, as it is perfectly fine to do one from their own tradition. That said we must do one guru yoga, because it is not enough to have received the empowerment. The seeds of the four kayas have been planted in our being so we need to appreciate and nurture this potential. If we just toss the seeds aside, they will simply rot away. In sum, the Karmapa stated that there are a great number of yidam deity practices and guru yoga is more encompassing as it contains them all. Whether we do a long or short one is up to us, but we must take a guru yoga into our practice. 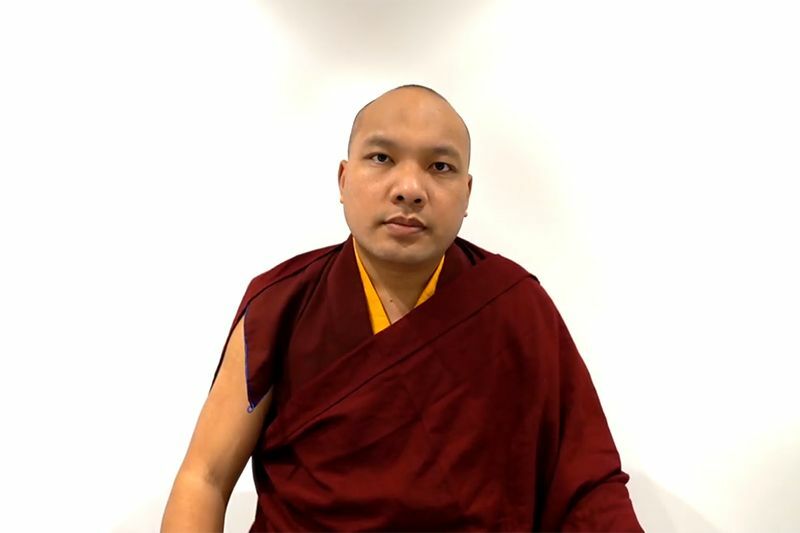 The Karmapa then turned to the guru yoga in the Torch of True Meaning, which explains the preliminary practices in the Karma Kamtsang tradition and commented on the reading transmission he gave yesterday, which covered the visualization for guru yoga. The text seems to be saying that we can visualize the guru above our heads or in front but actually the meaning is that the guru is in the sky directly in front of our head. His throne is held up by two lions in each of its four sides and covered in brocades and silks; on top of a lotus and moon seat is our teacher in the form of Vajradhara (Dorje Chang). The text describes him as “the combined essence of all the buddhas of the three times.” From the outside, his form resembles Vajradhara, however on the inside, he is our kind root lama, who has taken the form of Vajradhara. This visualization helps us to see our lama as a realized being. 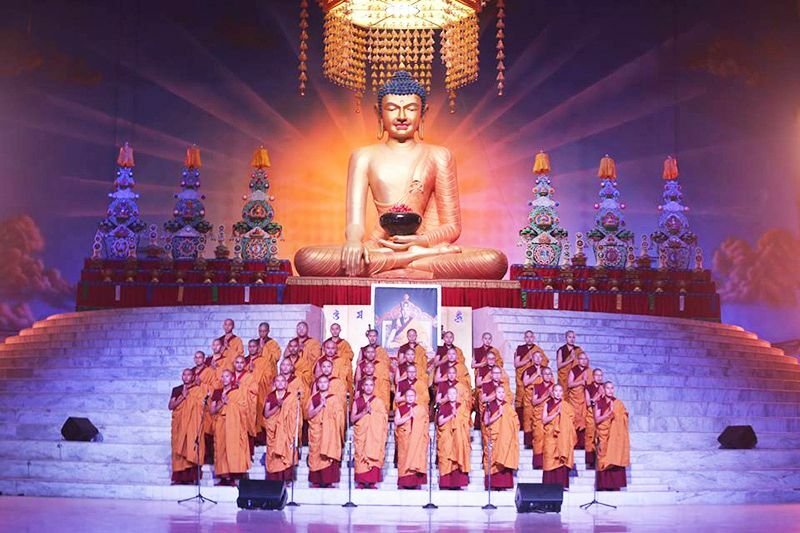 The Karmapa then queried: Who is the Buddha? If we do not know, how could we possibly meditate on our guru as the buddha? When we think of the buddha, the Karmapa commented, what usually comes to mind is a golden statue of a figure resting in meditative equipoise. (The Karmapa turned around to point out the tall buddha behind him.) But if we think about it, we can see that the first statues of the Buddha were created some 600 years after his lifetime, so we cannot say for sure what the Buddha really looked like. Even if we could have been present during his life, it would have been difficult to recognize him, so we have to use our imagination to guess how he was. A story recounts that when the Buddha was practicing austerities for six years while sitting under a tree on the banks of the Naranjuna River, he became so emaciated that he came to resemble the tree itself. When a young Brahmin woman offered him yogurt (some say it was kheer, sweet cooked rice), she thought she was giving it to a tree spirit. When he became enlightened at dawn, the Buddha again was sitting alone under a tree as many meditators in India have done for centuries. Looking at him from the outside, there was nothing special to see. He was simply relaxing in a serene and peaceful atmosphere with no one to applaud his achievement. Usually it is said that the Buddha is inconceivable, way beyond our ordinary minds. However, if we think of him like as some mythical being, it is difficult to make a heartfelt connection with him. To remedy this, we meditate on our authentic lama as the Buddha, thereby creating a connection so we can feel closer to the progenitor of the lineage. The Karmapa returned to the text and continued describing the field of refuge. We visualize our root guru as Vajradhara, and in a column above him are the lineage lamas, surrounded by siddhas of the Kagyu practice lineages, such as Drikung, Drukpa, Tsalpa, and Taklung plus gurus from other lineages, such as the Great Perfection, the Six Yogas, the Path and Result, Pacification, Chö, and Mind Training. Surrounding them are the gatherings of yidam deities, buddhas, bodhisattvas, heroes, dakinis, Dharma protectors and guardians. If it is too difficult to imagine all these figures, the Karmapa said it would be all right to consider that all of these beings are embodied in the central figure of Vajradhara. It is especially important to think of our lama as incorporating all of the Three Jewels. 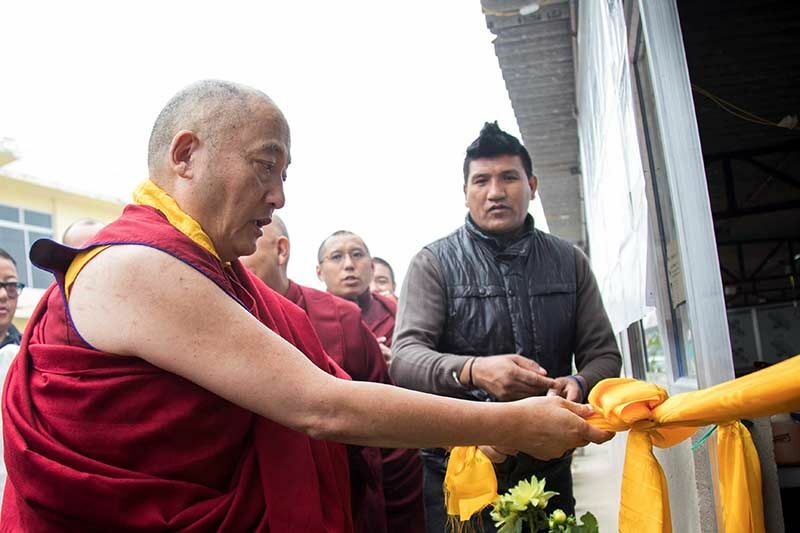 Recalling a story about Drukpa Kunley, the Karmapa clarified why it is important to visualize our lama as connected to the buddhas, yidams, and so forth. If we do not, there is a danger of ignoring these other figures, and just focusing on the lama, whom we imagine to be a plump, yellow-robed monk or a wild tantric yogi. This is just mixing some concepts together and meditating on them, the Karmapa stated. Therefore, we must not reject the myriad figures in the field of refuge but see them as inseparably connected to our guru. Actually this is the case, since their essential nature is the same: There is not one yidam deity separate from our lama. This way of thinking also enhances our feeling that the guru above our head is worthy of veneration. In this frame of mind, we fervently supplicate the lama from the depths of our heart. Speaking in general about supplicating, the Karmapa remarked that there are wonderful prayers of calling the lama from afar, especially the one composed by Jamgön Kongtrul Lodrö Thaye. However, in these prayers, we criticize ourselves top to bottom, listing our many faults and describing how terrible we are. On the one hand, it is good to recognize our shortcomings, to see our faults as faults, but as Drukpa Kunley remarked, our supplications to the guru wind up being merely criticism and put-downs of ourselves. “Whatever direction I turn to, it’s inauspicious. Wherever I sit, grass won’t grow.” This wailing is not supplicating the lama as the texts intend. 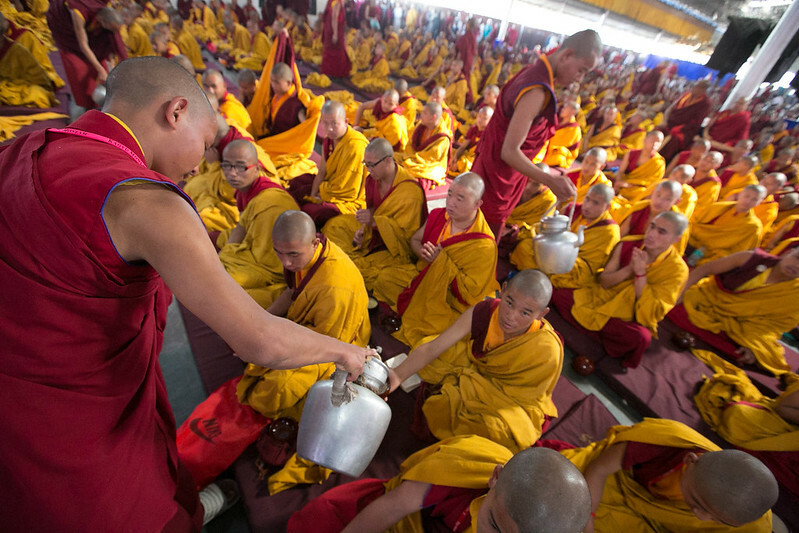 Instead, the Karmapa explained, along with numbers of living beings as vast as space, we pray to the lama—seen as the essence of all lamas—with as much devotion as we can summon from the depths of our being. This also provides the opportunity for us to rest in meditation on the empty aspect of our experience of devotion, thus combining the practice of devotion with mahamudra. The text then speaks of taking the four empowerments. In the secret mantra tradition, the Karmapa taught, it is important, and not easy, to maintain our samaya commitments and do the practice every day. The self-empowerment is a way to restore downfalls by taking the four empowerments described in the text. 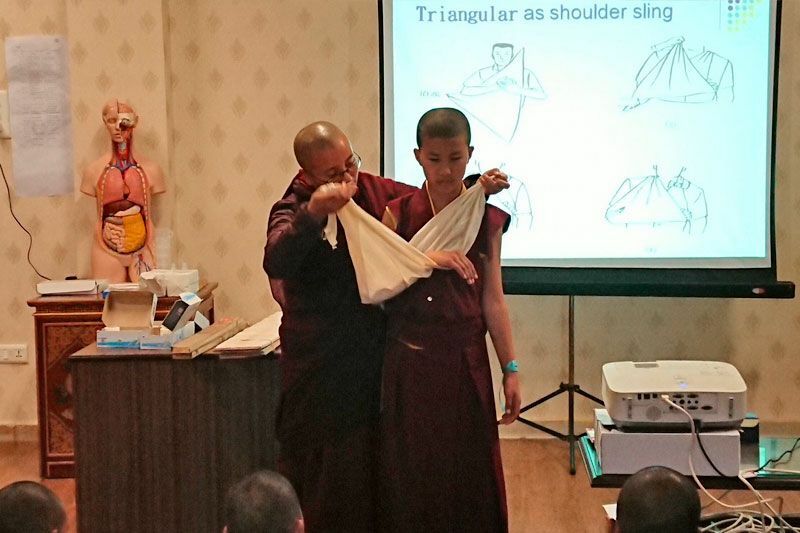 Traditionally, it is said that a broken samaya should be restored within the duration of a session, and this is another reason why Mikyö Dorje’s guru yoga is done in four sessions, two in the morning and two later in the day. With this, the Karmapa concluded the session for the day and will continue to teach the guru yoga in two sessions tomorrow.